Recently a couple of our good friends came over for dinner. Since one of them had just celebrated a birthday, I thought a birthday-appropriate dessert was in order. I remembered that he had absolutely LOVED the Boston cream pie cupcakes that I made for them a while back, so I thought this would be the perfect opportunity to try out a real Boston cream pie. 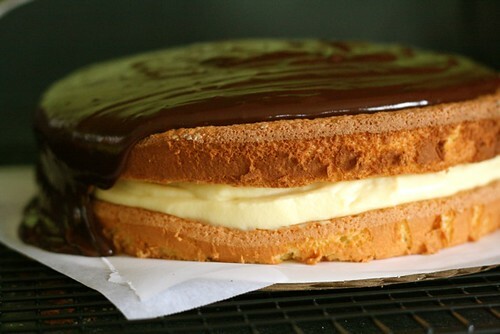 In case you aren’t familiar, a Boston cream pie is two layers of yellow sponge cake filled with vanilla pastry cream and coated with chocolate ganache. Why is it called a pie, you ask? Supposedly it did originate in Boston in the 19th century, and back then pie pans were much more common kitchen equipment than cake pans – hence the name. There is nothing particularly complicated about this cake. You just need to ensure that you set aside enough time to let the pastry cream chill and the ganache set. I have professed my undying love for this pastry cream before, and I still feel the same way. All that wonderfulness in combination with the light, moist sponge cake and the smooth ganache yields a truly fabulous dessert. 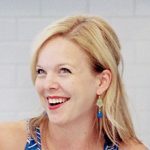 One kitchen trick I have heard about previously but never remembered to try until now is to use strips of wax or parchment paper under the edges of your cake on the cake board. You leave them there until the glaze sets and simply peel them away. This prevents the excess glaze from making the cake board messy. It really did a nice job and I will be sure to use this technique again in the future. To make the cake, adjust an oven rack to lower middle position. Preheat the oven to 350° F. Line the bottoms of two 9-inch round cake pans with wax or parchment paper. Grease and flour the sides of the pans; set aside. In a small bowl, whisk together the cake flour, all-purpose flour, baking powder and salt. Combine the milk and butter in a small saucepan and heat over medium-low heat until the butter melts. Remove from the heat and stir in the vanilla; set aside. Separate 3 of the eggs, putting the whites in the bowl of a stand mixer and reserving the 3 yolks plus the other 2 whole eggs in a separate bowl. Fit the mixer with the whisk attachment and beat the 3 whites on low speed until foamy. Increase the mixer speed to medium and gradually incorporate 6 tablespoons of the sugar. Continue beating until the whites form soft, moist peaks, being careful not to overbeat. Transfer the egg whites to a clean mixing bowl and add the yolk-whole egg mixture to the stand mixer bowl. Beat the egg mixture with the remaining 6 tablespoons of sugar at medium-high speed until the mixture is very thick and pale yellow in color, about 5 minutes. Add the beaten eggs to the bowl with the egg whites. Sprinkle the flour mixture over the beaten eggs and whites. Fold in very gently with a spatula, about 12 strokes. Make a well in one side of the batter and pour the milk-butter mixture into the well. Continue folding until the batter shows no trace of flour and the eggs are evenly mixed. Immediately divide the batter between the prepared cake pans. Bake until the tops are light brown and spring back when touched, about 16 minutes. Immediately run a knife around the edges of the pan to loosen the cakes. Place one pan on a towel and cover the pan with a plate. Invert the pan so that the cake is upside down on the plate. Peel off the wax paper and reinvert the cake onto a wire rack to cool completely. Repeat with the second cake layer. To assemble the cake, place one cake layer on a cardboard cake circle. Place strips of parchment or wax paper underneath the edges of the cake all the way around the perimeter. If desired, reserve about half a cup of pastry cream for decorating. 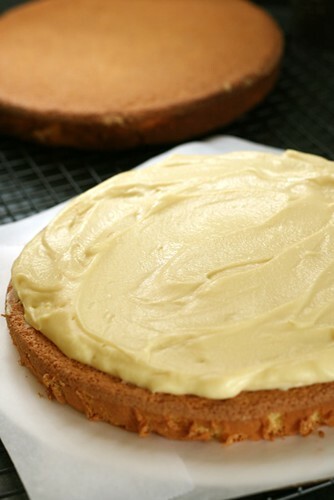 Spread the remaining pastry cream in an even layer on the first cake layer, all the way to the edges. 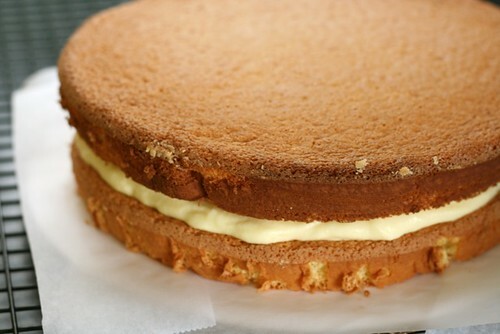 Top with the remaining cake layer and press down gently. 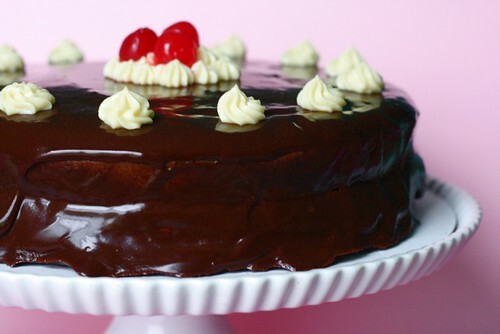 Pour the glaze onto the middle of the top cake layer and let it flow down the sides of the cake. Use a spatula, if necessary, to help cover the sides completely. Let the cake sit until the glaze fully sets, about 1 hour. This cake is best served the day it is made.